I am very proud of some of my new pieces I have been doing for clients. This bracelet and earrings were made to go with a twisted freshwater cultured pearl multistrand necklace. All that they have in common, in fact, are some of the beads. The bracelet is free-form peyote, ladder and brick stitch with a beautiful Swarovski button closure. I inserted one strand of gold chain in the middle because I thought it would change things up. These I felt were very successful and I'll have to make more! Wow, what a fantastic, busy and family-filled holiday season this has been. No sooner had I returned from the wonderful knitting tour to Ireland when I found myself on a plane again with my husband bound for Naples, Florida and Thanksgiving with my family. Turn around again and we're on a plane to Chicago and Christmas with Frank's sister, kids, grandkids and Frank's 95-year-old father. 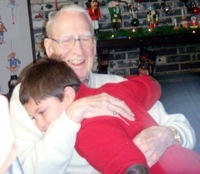 (Shown being hugged by great grandson Noah Cain). It was all very hectic but really not as bad as I thought to be traveling during the holidays. Meanwhile in all the little nooks and crannies of time in between, I was kept really busy making over a dozen new pieces of jewelry from internet orders and new clients. The piece shown above is my donation to the Children's Chorus of Washington annual gala auction on March 1, 2008. This is my second year of contributing and I know that my piece last year did very well for them. This one is freshwater cultured pearls in lovely shades of green. The pearls are "coin" pearls and "stick" pearls and the earrings are quite sleek, if I do say so. I can do them in a number of colors for $235 for the set. I call them Gathering Stems. I will be teaching at Star's Beads in Vienna, Va. again this spring: Friday, April 11 will be my Wireworked Bangle; Friday, May 2 will by my Froth and Glitz fiber and bead necklace; and on Friday, April 25, I am teaching a new class, Moons of Saturn. This will be really fun as I am teaching a number of techniques (as usual): needle felting and embellishing beads and wire worked beads, all combining into one fantastic necklace. All classes are 10-4pm. 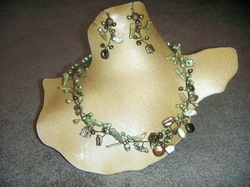 For more details, check Star's Web site: http://www.starsbeads.com/.